If you are currently using iPhone 5 and planning to upgrade to the latest iPhone 6s, you’d better learn how to transfer data on your old iPhone 5 to iPhone 6s. If you have got the new iPhone 6s at hand, you have to know how to migrate data to your iPhone 6s. If you want to transfer data of certain type only you value the most, for example the notes, you need to know the solution to transfer the iPhone 5 notes to iPhone 6s selectively. To transfer the notes directly through restoring from iTunes or iCloud backup, you need to sync all the data on your iPhone 5 to iTunes or iCloud and create iTunes or iCloud backup. Before starting, it is highly recommended to update you old iPhone 5 to iOS 9 to ensure that there will not be any compatibility issues arise when you migrate from your old iPhone data on iOS 8.x.x or lower to iPhone 6s running on iOS 9. Currently, the most current version is iOS 9.0.2. Please update your old iPhone 5 to the latest iOS 9.0.2 by following the onscreen instructions. Please note that if you want to transfer the notes from your old iPhone 5 to iPhone 6s through restoring from the iTunes backup for old iPhone 5, other data like contacts, messages, email accounts, photos, and other personal settings will be transferred to your brand new iPhone 6s simultaneously. Before you start creating backup for your old iPhone 5, please make sure you are running the latest iTunes version, if not, download and install the latest version. Create a back up of your old iPhone using iTunes. Turn off your old iPhone after the backup is complete. Remember to turn off your old iPhone as it will cause conflicts with the backups in iCloud. Turn on your new iPhone and complete the setup assistant. 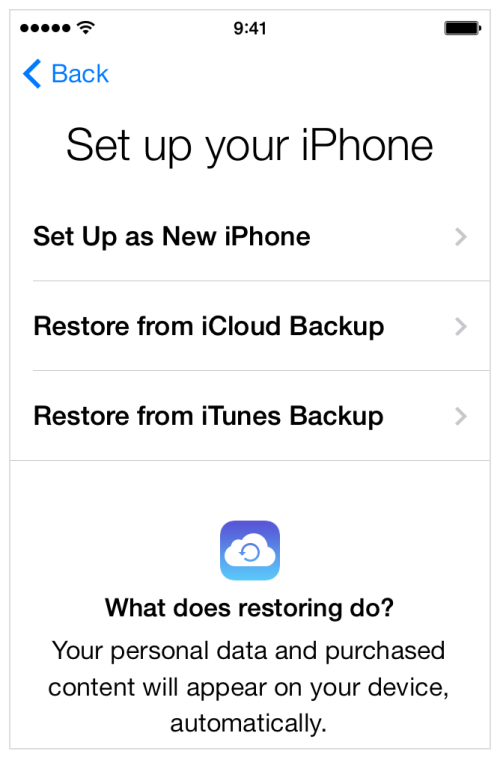 When prompted to Set Up iPhone, tap on Restore from iTunes Backup. Now connect your new iPhone to your computer on which you used to back up your old iPhone. Select the backup of your old device and choose Continue. Make sure to choose the latest backup that contains the most recent data on your old iPhone 5 in case of missing something. The restoring process can take quite a long time depending on the amount of data included in the iPhone 5 backup and the network connection speed. After the process finished, all your iPhone 5 notes items will be restored to your iPhone 6s. Usually, iCloud backs up your device everyday as long as you have switched on the automatic backup through iCloud. However, it is still necessary to manually backup your old iPhone 5 before migrating everything to your new iPhone 6s in case that something is missed. Head to iCloud > Storage & Backup and tap on Back Up now button. The backing up process may take time depending on the amount of data on your old iPhone 5. Once the backing up is finished. Follow the on-screen instructions to select your language and country, and choose whether to enable Location Services and choose Wi-Fi network as well as choosing Restore from iCloud Backup to set up your iPhone 6s. Enter your Apple ID and password, and tap Next. Tap to agree the prompted terms and conditions. Select the latest backup of your old device and tap Restore. Also, the restoring may take quite a time if the iCloud backup includes large amount of iCloud backup. The last but never the least. Here comes an easy solution, as the two methods mentioned above seemed to be sort of complicated and fussy. And it transfers all the other data while you want the notes only. What if just want the notes only? Is it possible to transfer the notes items from the iPhone 5 to iPhone 6s selectively. Sure, you can. iFonebox can accomplish the mission which seemed to be impossible. As the specialized iPhone data recovery software, you can export and transfer contacts, notes, messages, reminders, calendar, voice memos, whatsapp messages, webchat messages selectively from iPhone, iTunes or iCloud backup. Please note that iFonebox is available for both Mac and Windows users, please choose the right version to download according to what kind of computer you are using. Install the full version of iFonebox and start it up. 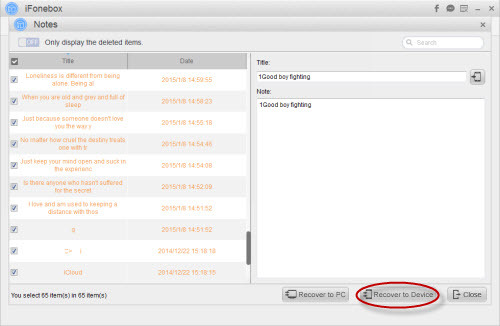 Choose the recovery mode of “Recover form iTunes Backup”. Then the next interface will present you with a list of iTunes backup files for your selection, please choose the latest one you have created for your old iPhone 5. Choose the notes to recover by clicking on the icon for Notes App on the following interface showing all the supported data categories. Preview all the notes items exported and do some modifications if you prefer before transferring. Connect your iPhone 6s to your computer and hit the button of Recover to Device to transfer all the notes items you have selected to your brand new iPhone 6s. 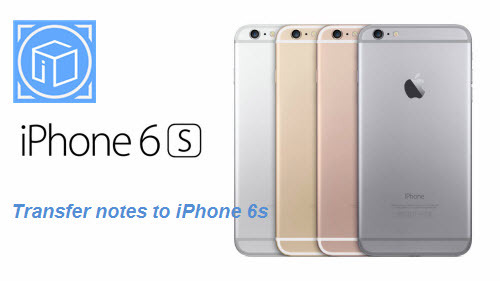 Transferring notes from iPhone 5 to iPhone 6s is super easy and fast with iFonebox, isn’t it? This entry was posted in iPhone 6S and tagged migrate notes from old iPhone to iPhone 6s, sync notes from iPhone to iPhone, transfer iPhone 5 notes to iPhone 6s, transfer notes to iPhone 6s by IosdroneD. Bookmark the permalink.